Core Sans C is a geometric sans serif typeface created by Hyun-Seung Lee together with Dae Hoon Hahm & Dong – Kwan Kim and published by S-Core which was inspired by geometric shapes. It is available in 9 weights (from Thin to Black) and their italics, a wide range of OpenType Features and multilingual support. It is ideal to use for small print sizes, display, web, l;ogo, magazine etc. 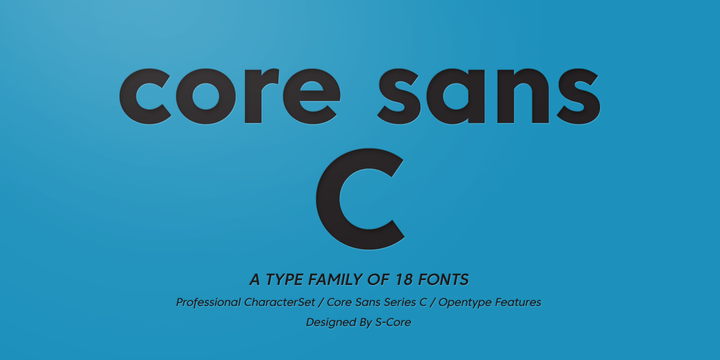 Core Sans C is part of Core Sans Seriers (N M E A D G R B). Price: starting from $20 for one font to $140 for all 18 fonts. A font description published on Thursday, April 14th, 2016 in Dae-Hoon Hahm, Dong-Kwan Kim, Fonts, Hyun-Seung-Lee, S-Core by Alexandra that has 4,205 views.